Obesity Decreasing Among Young Children in WIC | Let's Move! The findings come from a study jointly released by the Centers for Disease Control and Prevention (CDC) and the United States Department of Agriculture (USDA) in CDC’s Morbidity and Mortality Weekly Report. This study follows additional research released in the last few years showing obesity rates declining among some of our youngest children in the United States. “We are beginning to see some progress reducing childhood obesity in some areas, but more progress is needed,” said CDC Director Tom Frieden, MD, MPH. “Only by accelerating and sustaining this trend, can we reverse the epidemic of childhood obesity.” Several factors may have contributed to this modest decrease in obesity among young children enrolled in the WIC program. In 2009, USDA redesigned WIC food packages to align with the updated Dietary Guidelines for Americans. In addition to improving the nutritional quality of WIC food packages, new regulations also led to better nutrition education and more healthcare referrals. Additionally, the revised WIC program better promotes and supports the establishment of successful long-term breastfeeding, provides WIC participants with a wider variety of healthy food options, and offers WIC state agencies greater flexibility in prescribing food packages to accommodate participants with cultural food preferences. 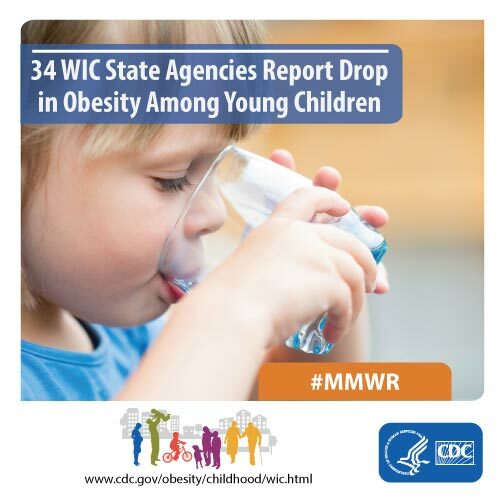 National, state, and local childhood obesity programs and reports helped raise awareness among various stakeholders, including parents, early care and education providers, community and business leaders, industry, health care providers, and public health officials. These included the First Lady’s national Let’s Move! initiative which launched in 2010 and the Institute of Medicine’s recommendations on early childhood obesity prevention. CDC’s Division of Nutrition, Physical Activity, and Obesity provided funding, training, and guidance to states, local health agencies, and daycare providers to help promote successful childhood obesity prevention strategies in early child and education settings. For more information about CDC’s childhood obesity prevention efforts and the latest statistics, visit www.cdc.gov/obesity/childhood.